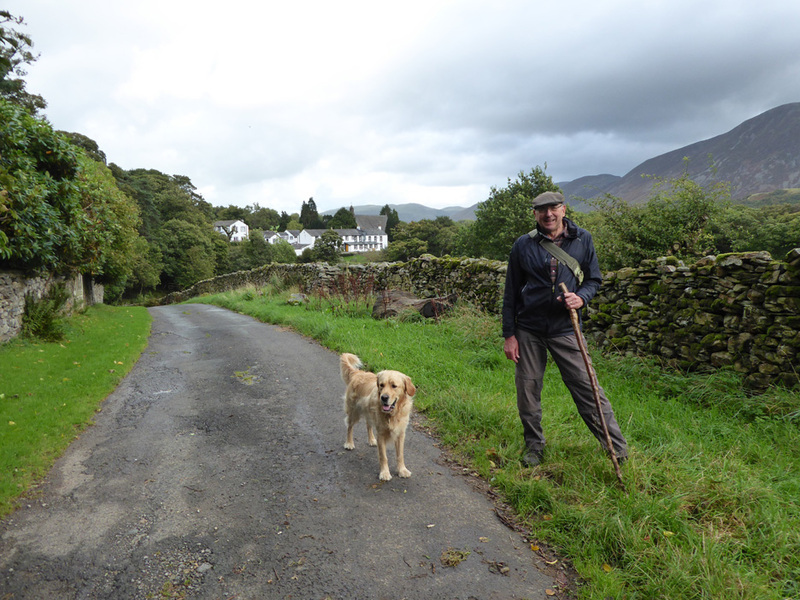 " First walks back home "
Date & start time: Thursday 29th September 2016 and the last few weeks. 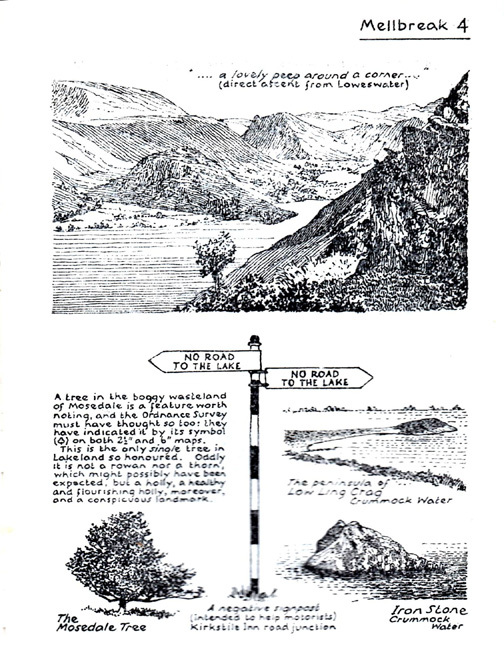 Places visited : Mellbreak top (north & south) Scale Force, Ling Crag and home. 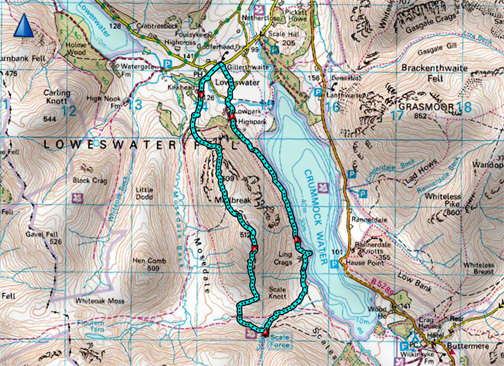 Main Walk details : 6.75 mls, 1900 feet of ascent, 3 hour 30 mins. 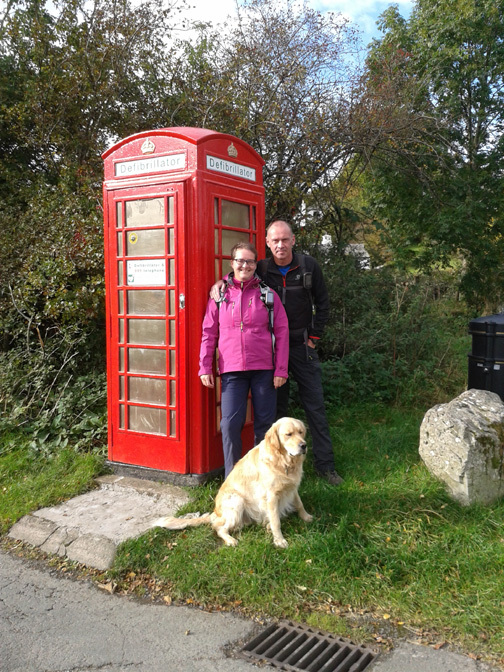 not forgetting Ann and the dogs, Harry and Dylan. Weather : All sorts . . . from the sublime to the ridiculous. 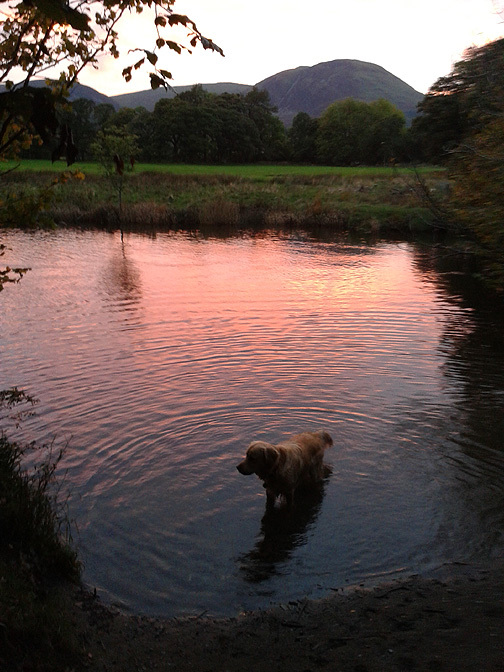 After our Scottish holiday we are back home and re-establishing our normal day to day routines here in Loweswater ... busy, busy, busy. 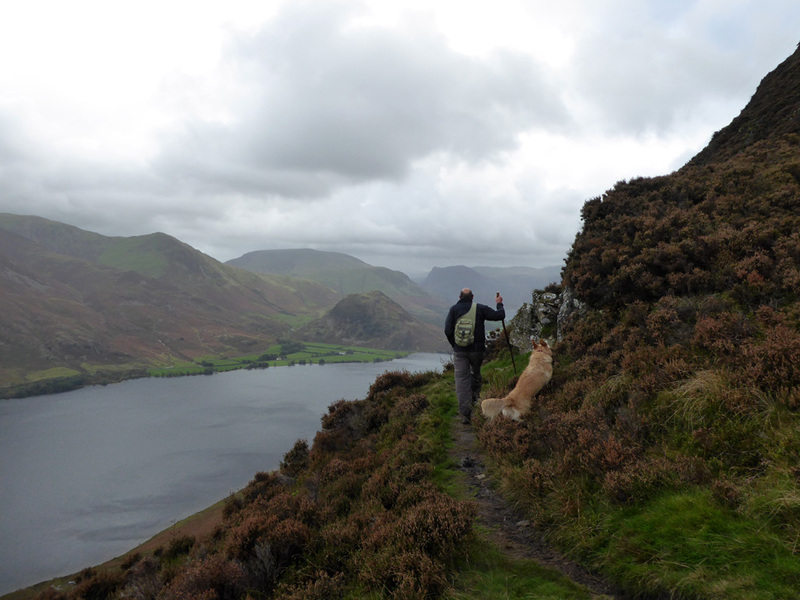 Still, the dogs have to be walked and on some days we had extra company on our outings in the valley and around the local fells. 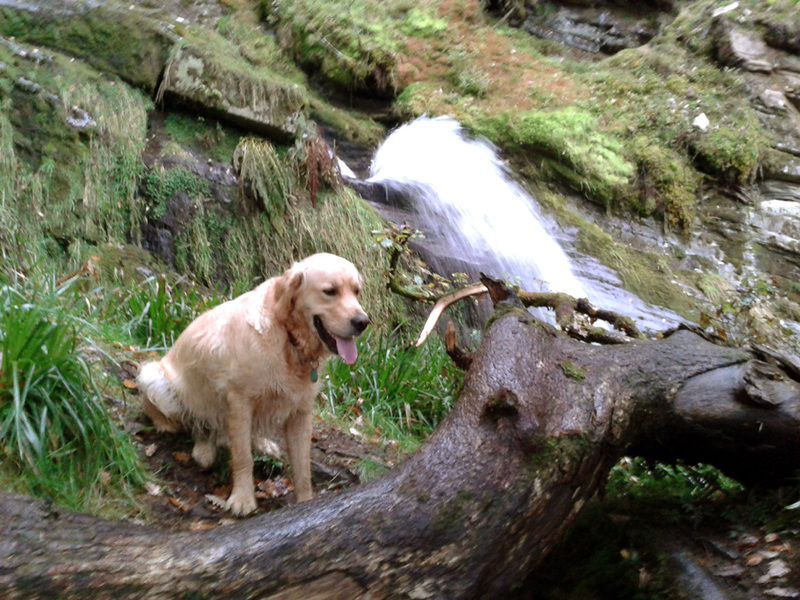 This is a compilation of the last few weeks outings, as all the pictures relate to our local area. to awake for the next few days to lovely autumnal sunshine. were up at the crack of dawn one morning, hours before us. which Hilary subsequently emailed on her return home. 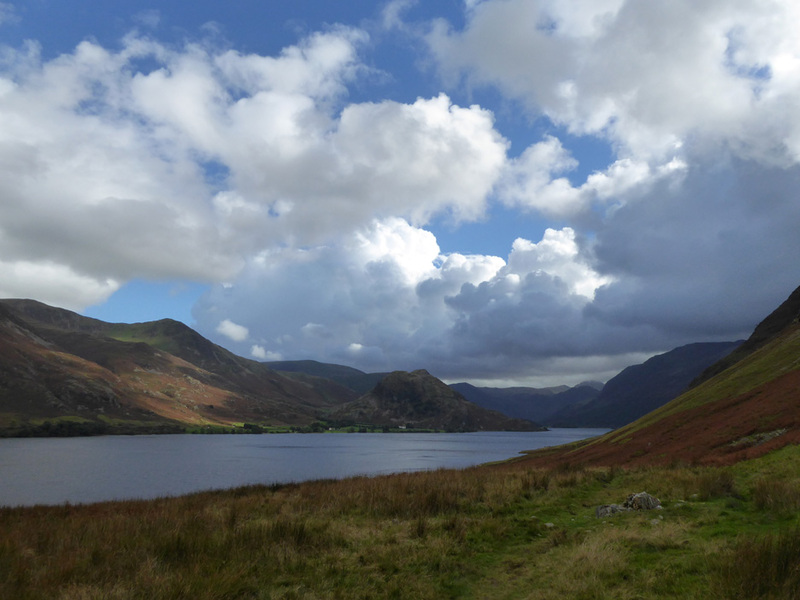 Early morning mist on Crummock Water. Sunshine and clearing mists . 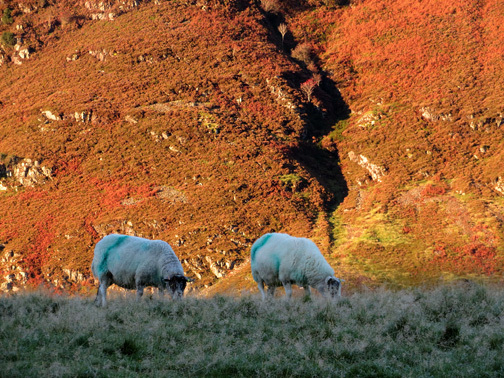 . . as the morning sun shone on the flanks of Mellbreak. Many thanks for the photos Hilary and Tony . . . must try harder . . . and get out of bed sooner on good days ! 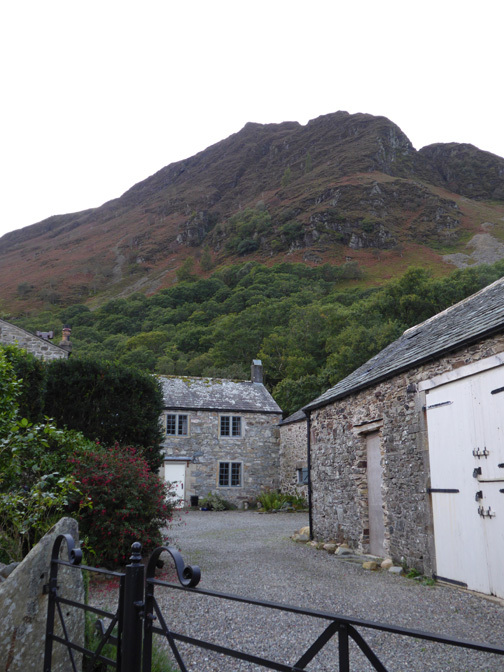 that he could see from the cottages each day. for the direct ascent of Mellbreak. 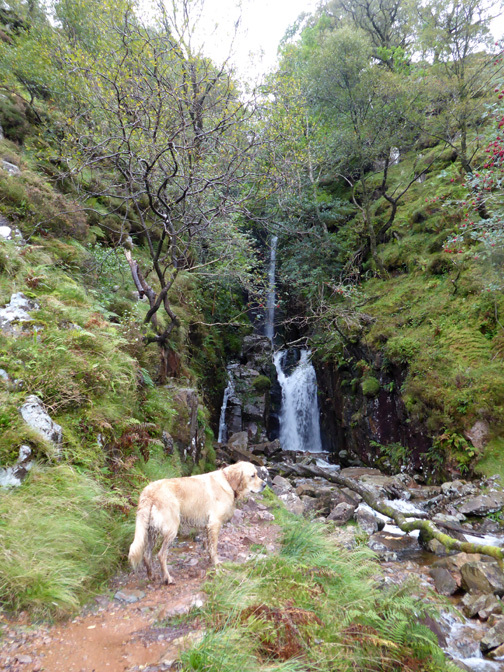 set out on a walk to Scale Force via Mellbreak summit. while Ann and Harry stayed back and made alternative arrangements for a smaller outing for themselves. Climbing above the trees below the face of Mellbreak, just as the slope starts to steepen. From here the only way is up . 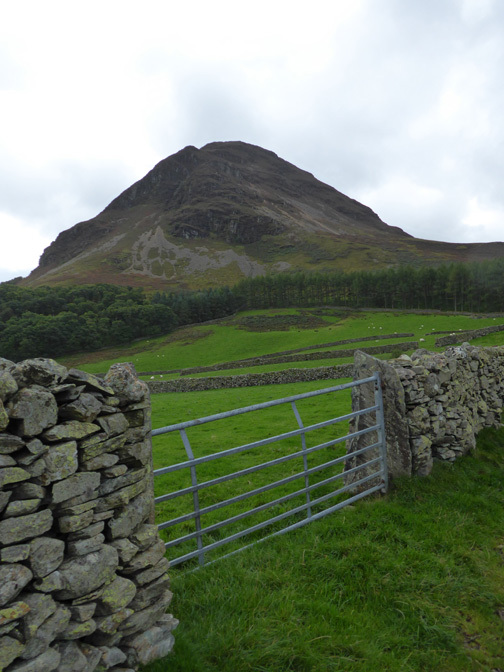 . . zig-zagging where possible to avoid the screes. 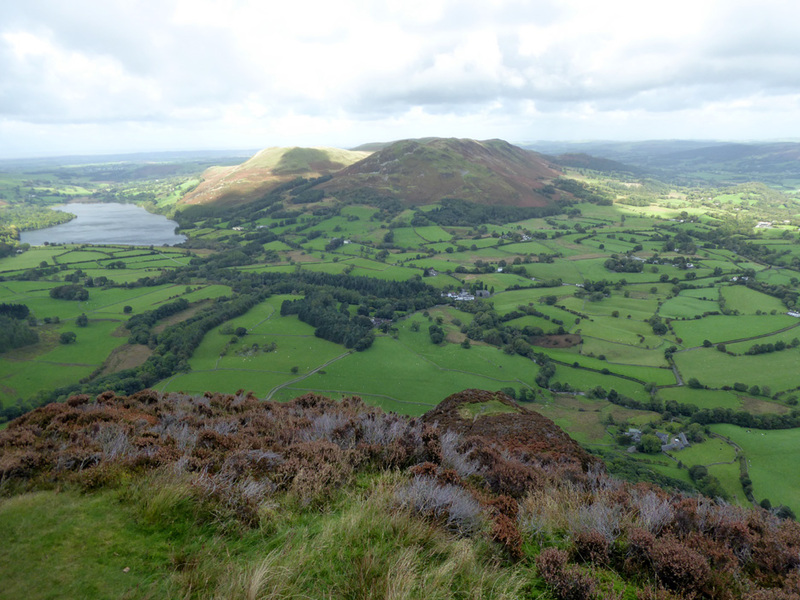 Two thirds of the way up is Wainwright's "Peep round the corner". Geoff does likewise . 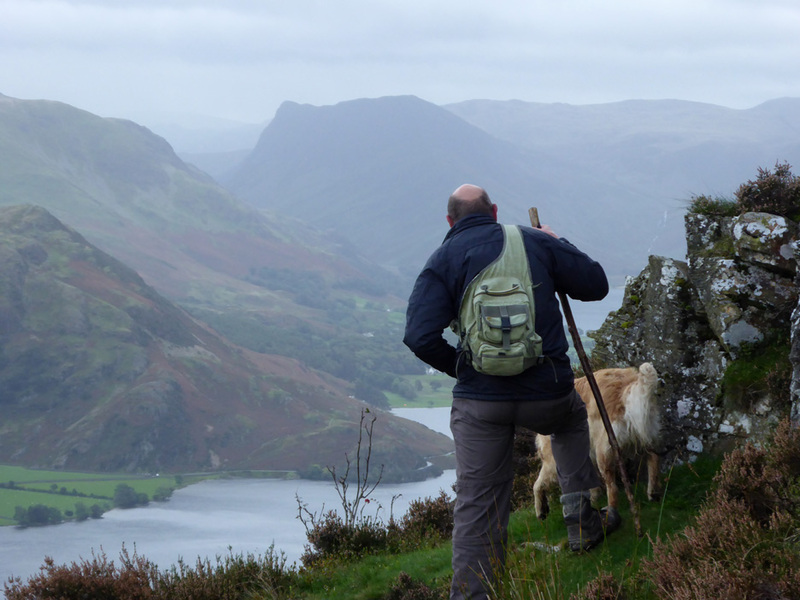 . . and enjoys the view of Buttermere and Haystacks in the slight mistiness of the day. The hard work is nearly done as the slope eases. 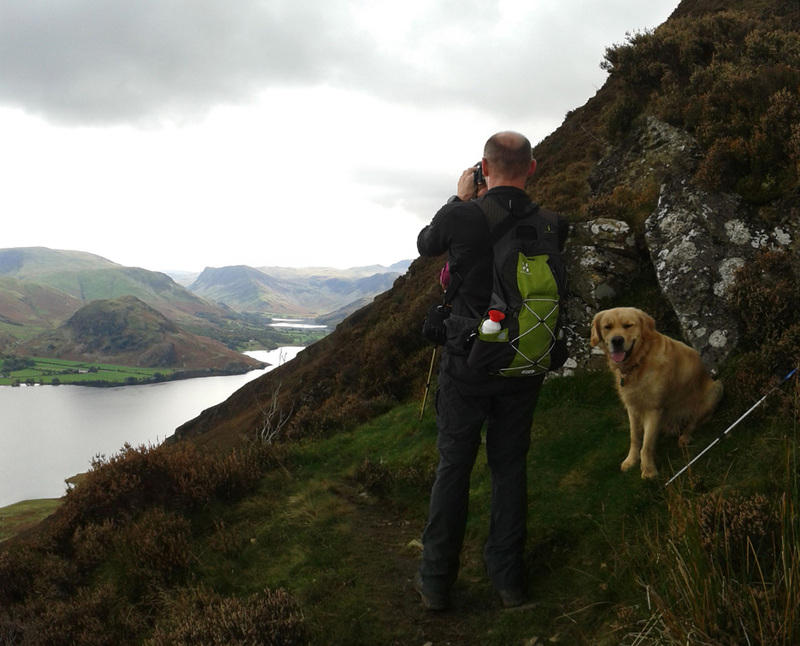 Behind us are Loweswater, Low Fell and the Lorton Valley. One more short climb and the summit will be reached . . . but the view north will be lost.
" Don't look so happy Dylan "
I think he's just realised that the real summit cairn at the other end of the fell is 3 metres higher. Even reaching that one . 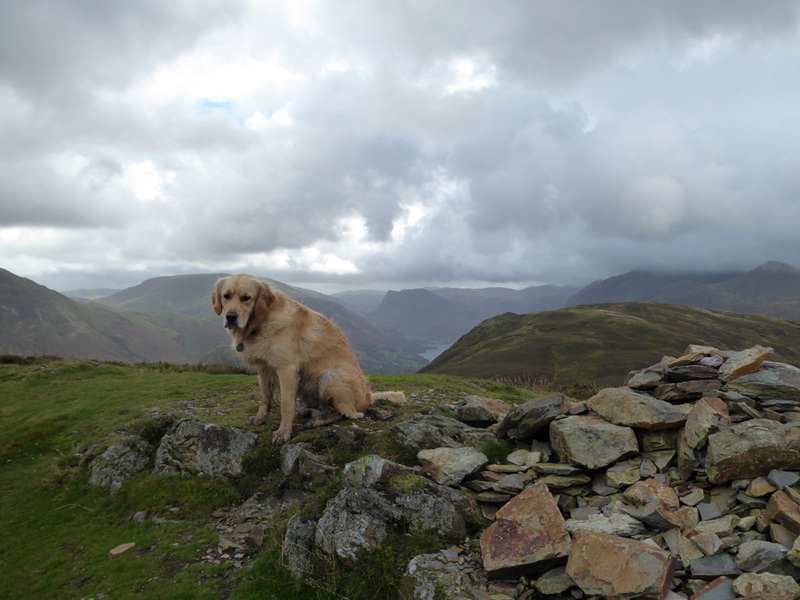 . . and both he and Geoff claiming the Wainwright Summit . . . he's still not happy. Perhaps it's the weather . . . perhaps he's missing Harry . . . or has he perfected the classic teenage blank stare just for the photos ? into the increasing dampness of the day. 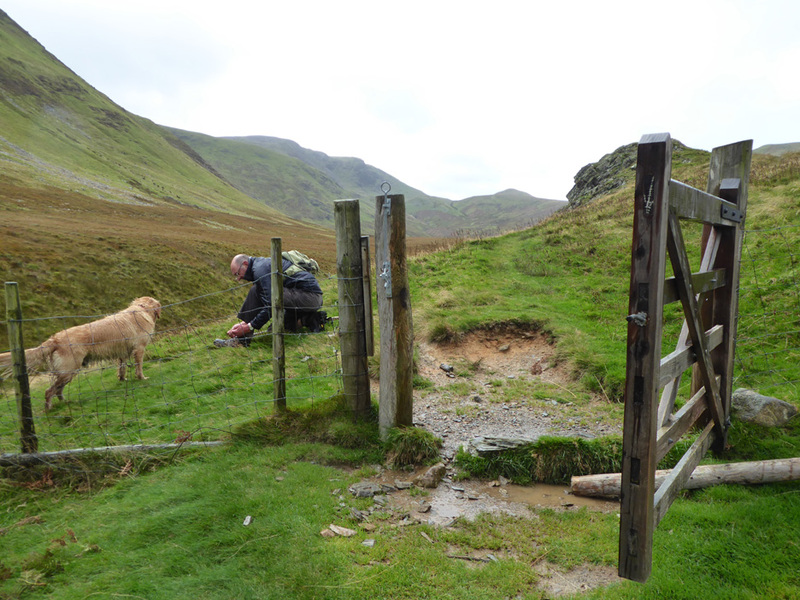 Checking the bootlaces after the descent and before crossing the stream that flows from the eastern side of Floutern Moss. 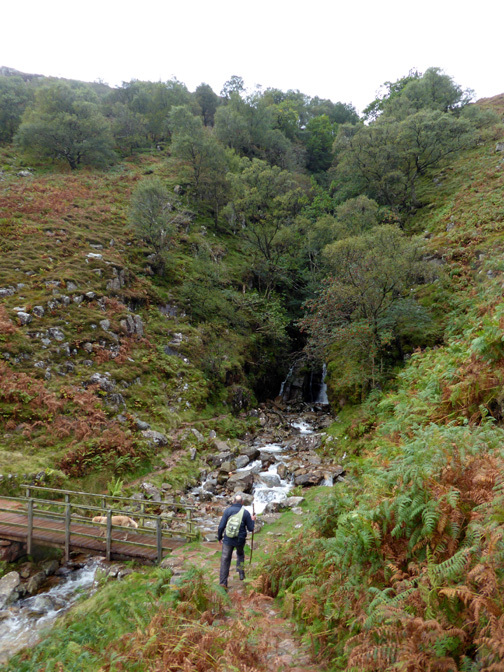 Down the fellside path to Scale Force . . .
. . . the waterfall is hidden deep in the cleft in the side of the hill. 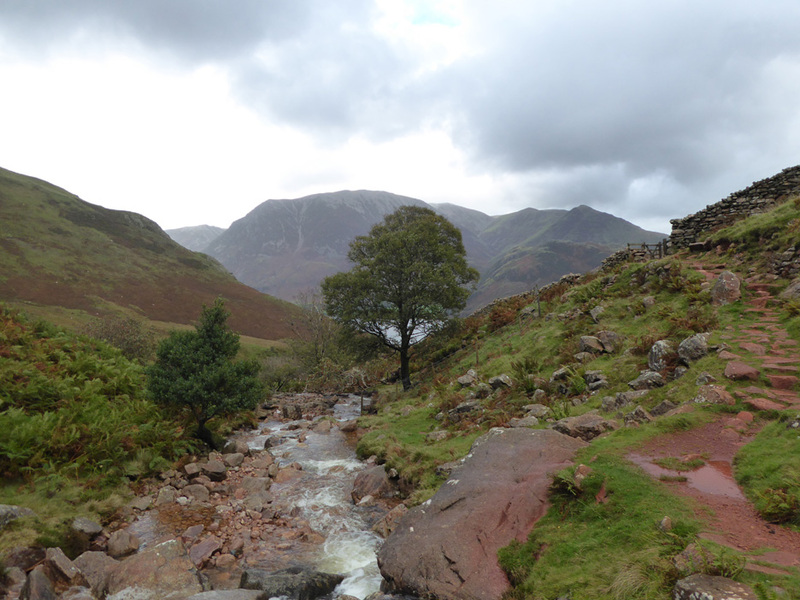 Scale Beck as it emerges from the falls and heads down towards Crummock Water. 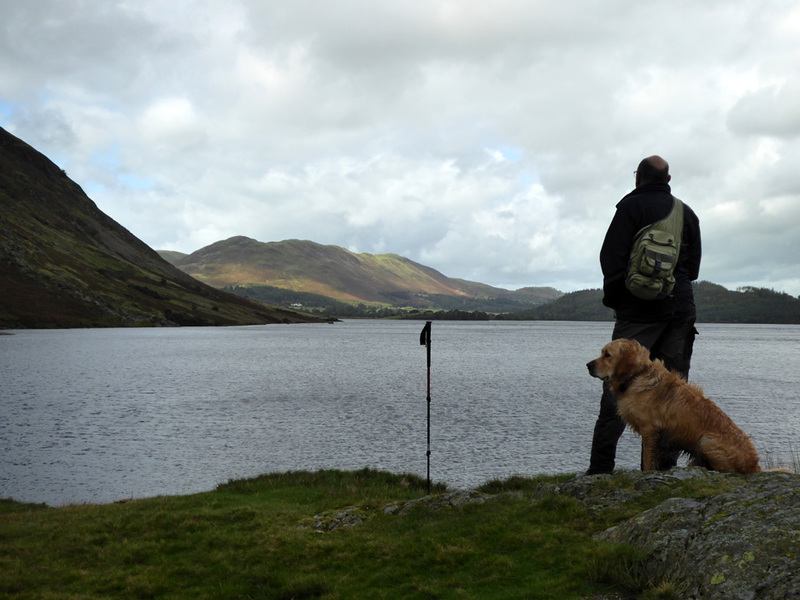 We've now walked down to the shores of the lake and will soon turn left, back towards Loweswater. 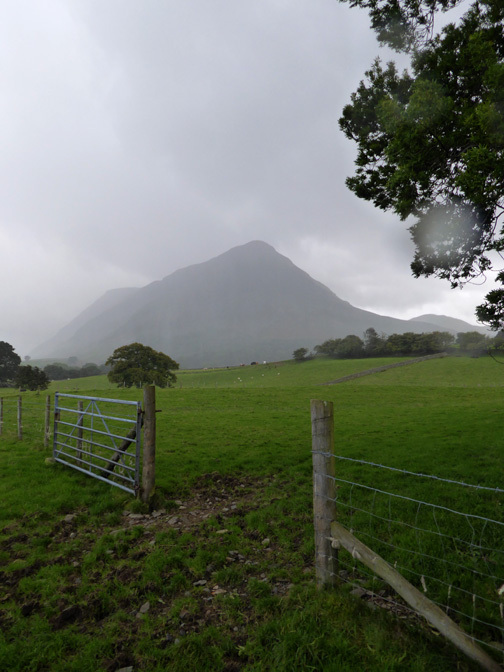 The wider view as the weather improves once again. 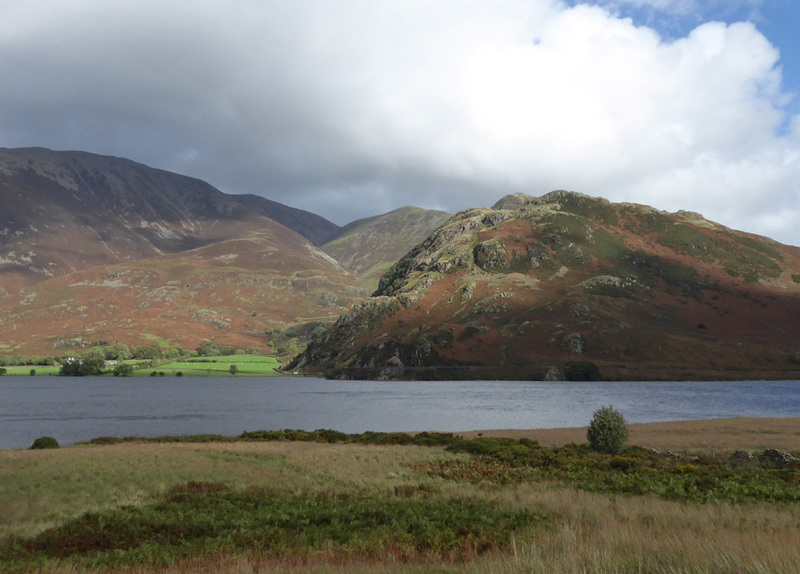 The fells here are Grasmoor, Whiteless Pike, Rannerdale Knotts, Robinson, Fleetwith Pike and the distant grey Knotts/Brandreth ridge. Looking down the lake from Low Ling Crag.
. . . and the reverse, as we climb the slight incline over to High Park on the way home. The classic frontage of High Park House . . .
. . . and another gathering shower as we reach home just in time. 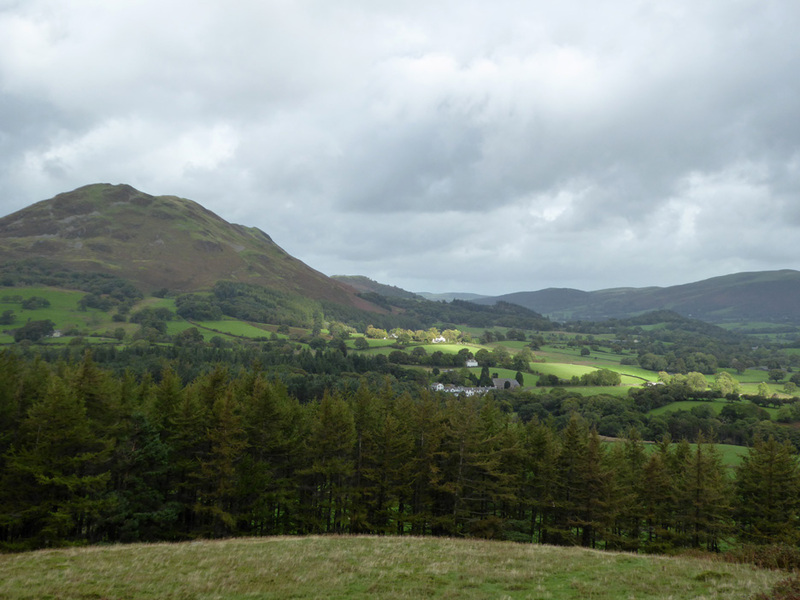 On other days the weather was sometimes better and some times worse, as befits this time of year. 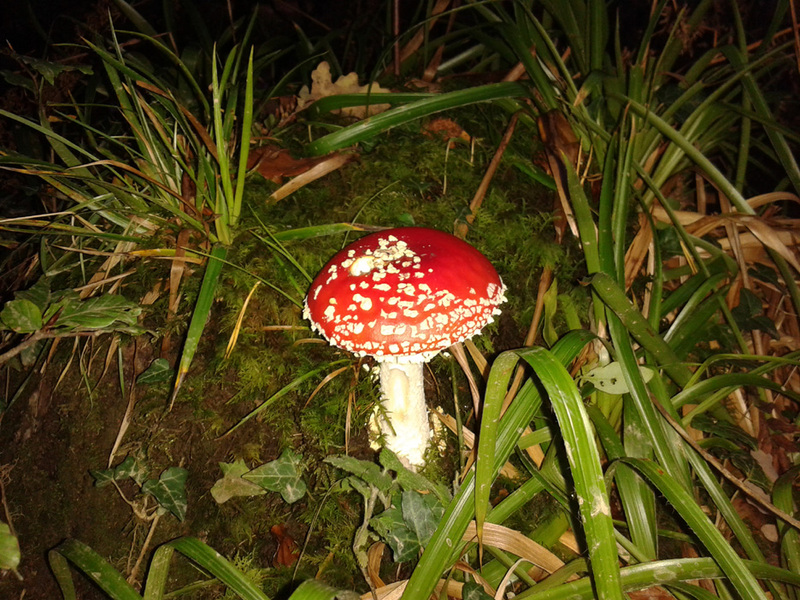 On occasions I took a camera, at other time just the old smart phone . 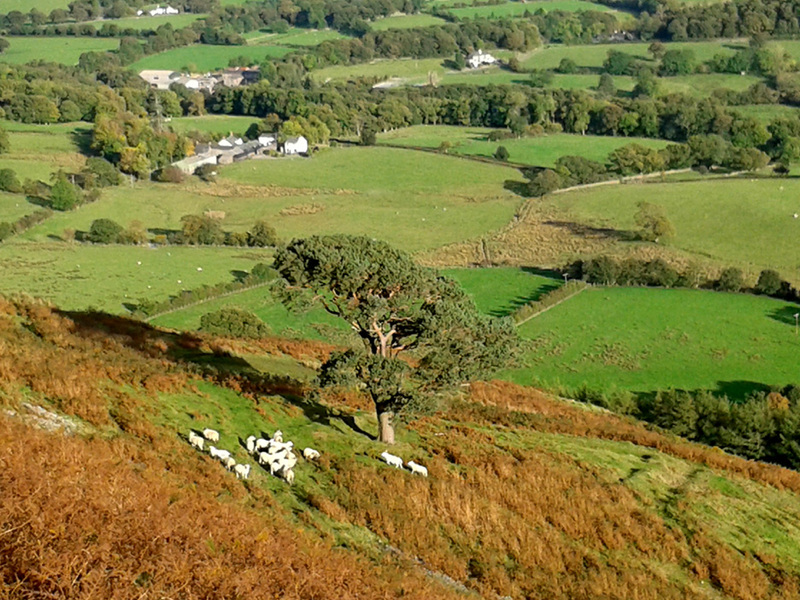 . .
A walk through Whinney Ridings Wood brought us across and back to the old pine tree on Low Fell. 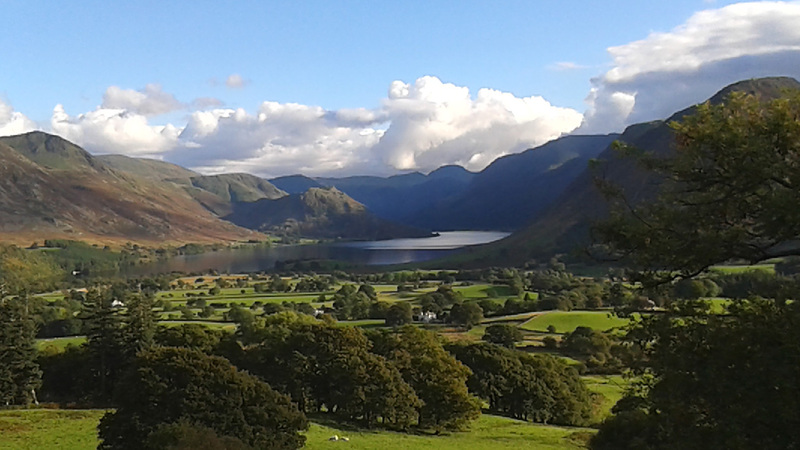 A beautiful view of the Buttermere Valley on the way down again. 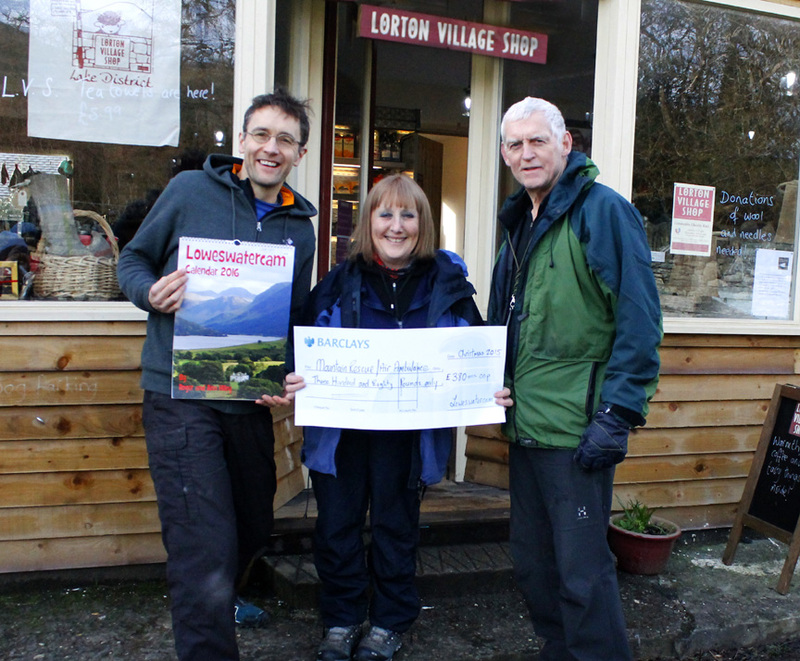 They very kindly sold our calendar last year and shared the publicity of your donation to Mountain Rescue/Air Ambulance. A year on and Lee and Arwen have decided to celebrate their first birthday in the garden at the rear of the shop. 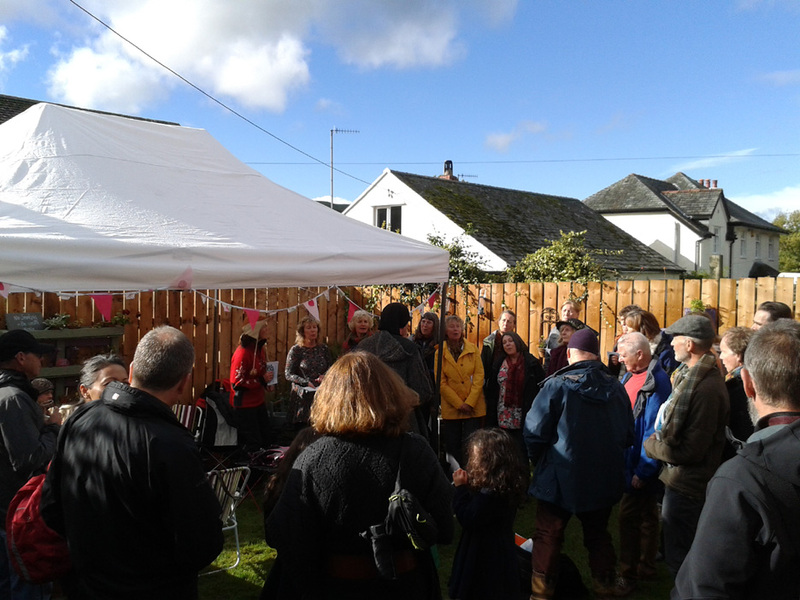 They have invited locals and customers to come along and enjoy the day. 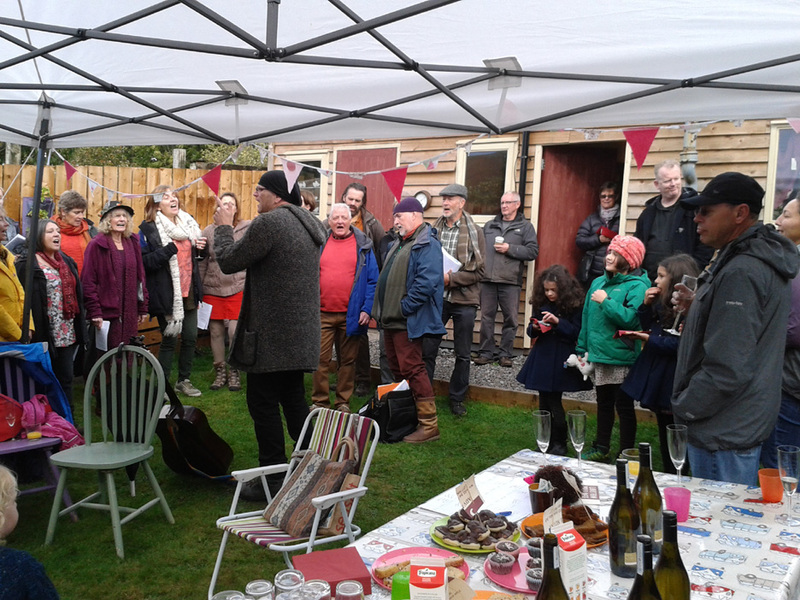 The local community choir called " Sing Owt " were on hand to delight us party-goers. They meet in Ullock Village Hall and are led by their conductor Dave Camlin. 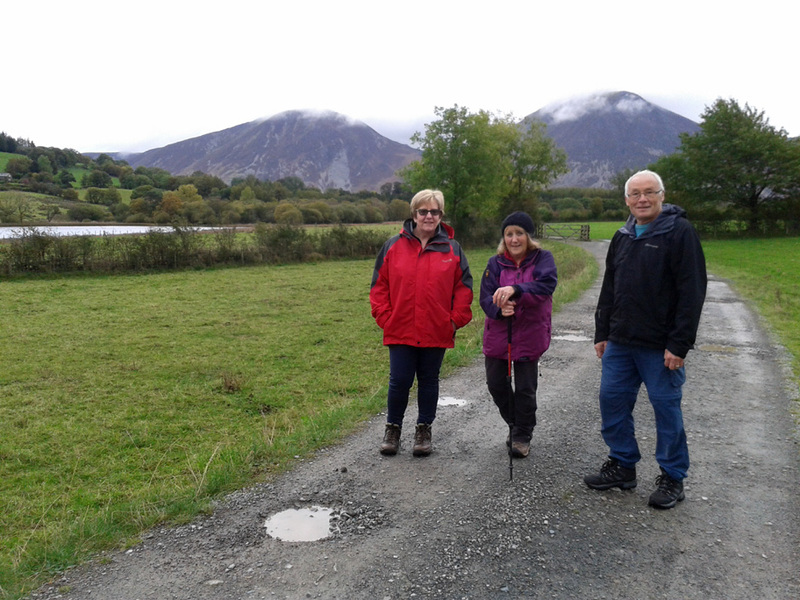 Other walks in recent days include one to Holme Wood with Bob and Glenis from Preston. 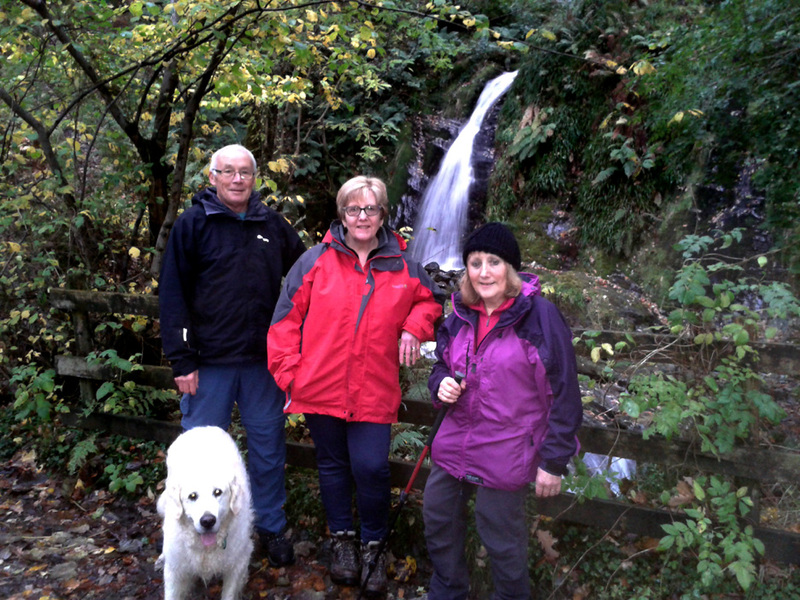 Bob, myself and Dylan made it right up through the woods to see Holme Force . . .
. . . while Glenis, Ann and Harry stayed lower down and admired the lower falls from the bridge. 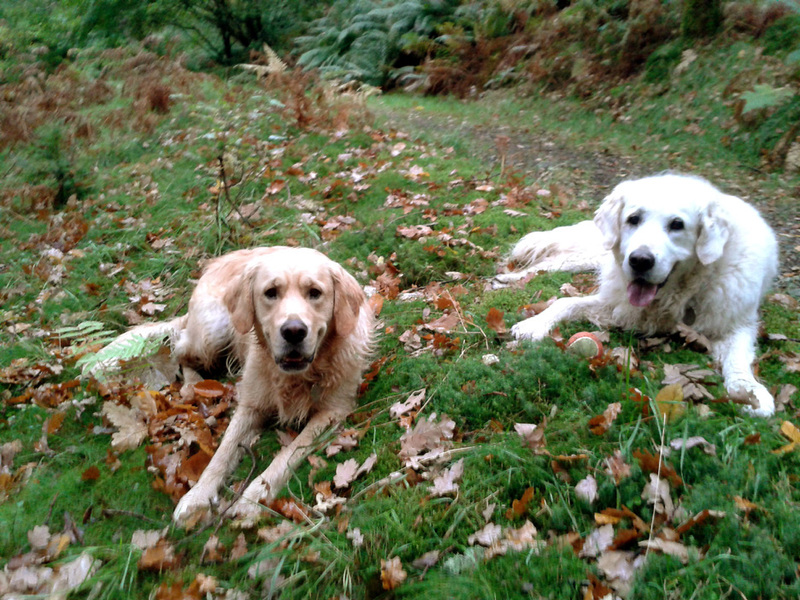 and soon the dogs and the colours of fallen leaves will match exactly. 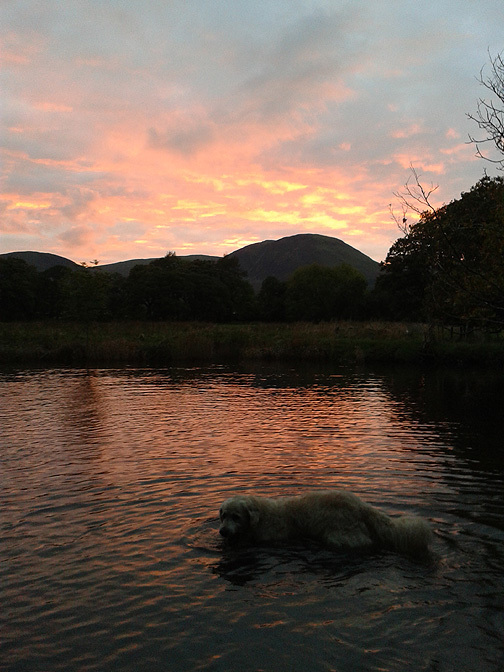 and they called over to Loweswater this week. to chose where they wish to walk. if I would lead them. How could I say no . . .
after all I had recommended it in the first place ! 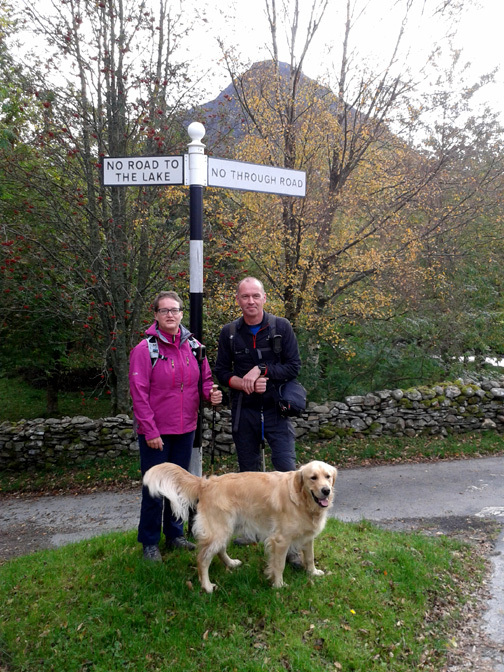 A quick photo at the start of the walk . . .
. . . at Wainwright's negative signpost. Just one photo of this climb . . . from that peep round the corner. 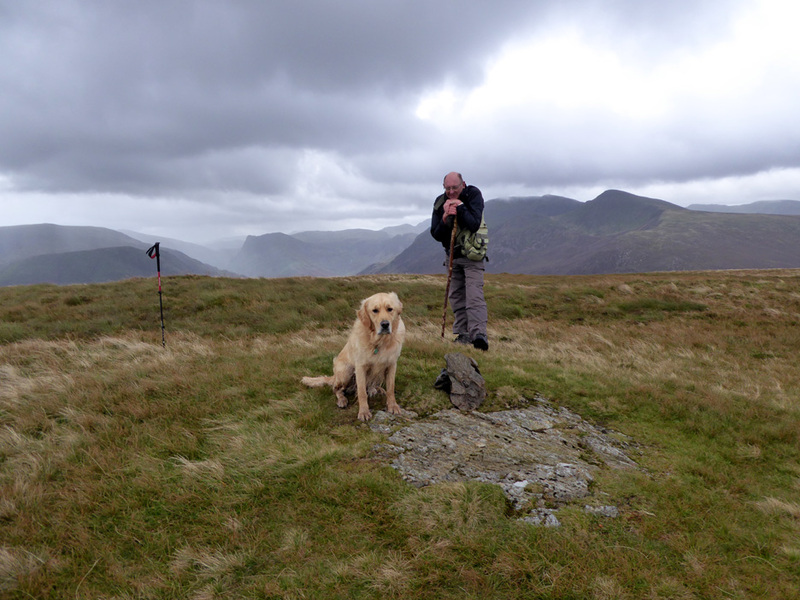 They walked on from the first top as Dylan and I returned home, but had a damp time by the end of their day on the fell. A late local walk in Scale Hill Woods at sunset . . .
. . . saw Harry and Dylan bathed in evening glory. and remember . . . the clocks go back next weekend. Technical note: Pictures taken with either Ann's new Panasonic Lumix TZ60, or various other photographic or telephonic equipment. This site best viewed with . . . visiting friends to add variety to the photos.